Great place needs alittle maintaining outdoors wise other than that good area. Residents are nice people and the amenities are great. Overall like it and would recommend to a friend. Living at 111 South has been enjoyable. I have a lot more space than many of my friends who are in different apartments. The pool, gym, and tanning beds are also a plus. Thanks so much for taking the time out to review us Melody! Glad you're enjoying #LivingSouth! Thanks for taking the time out to review us Courtney! Glad you're enjoying #LivingSouth! 111 is luxury student living at an affordable price. Nothing to complain about really. The kitchen is particularly nice, especially the countertops. I really like living at 111 South. Whenever I have a problem, I can go to the office and my issues are resolve. The people in the office are always friendly and willing to help the residents. Kadeshia, thanks so much for your feedback! We're happy to know that you feel confident in our staff to assist in any and every way we can! It's our top priority to make your time with us the best it can be! Super nice staff who do whatever they can to help you. The gym is always clean and I don’t have any complaints about the unit I live in. Comes with really nice furniture and a spacious room. Thank you for your review, Micaela! Our team is pleased to know that you're enjoying your time at 111 South! Don't hesitate to let us know if there's ever anything additional we can do for you! My residency experience at 111 South has been a good one! It was a good place to live after being in the dorms! When I came to visit to see if this was the place for me I knew right away it was! You can’t go wrong with 111 South! Hey Camryn, thank you for sharing your feedback with us! We're so excited that you chose 111 South for your first off-campus experience! Please let us know if we can do anything additional to make your time here even better! The staff here is great! Whenever problems arise, they are quick to fix them. My fiancée and I love living here and are looking forward to staying here one more year. Thank you for sharing your review, Cory! We're thrilled that you and your fiancé have decided to live with us again next year! Please don't hesitate to let us know if there's anything we can do to make your experience even better! Hi, Savanna - thank you for your review! Our team is so happy to know you're enjoying your time with us. Don't hesitate to let us know if we can do anything to make your experience even better! Living at 111 South for the past year has been amazing! Every time I’ve had an issue, the representatives didn’t have an issue helping me and they always did it in a timely manner! The grounds are always kept clean and they make sure that the residents with pets, clean up after them. The rooms are very spacious and the residents are quiet. I will be renewing! Charve, wow thank you for your kind review! We are so happy to know you've enjoyed your time at 111 South so much that you've decided to live with us again next year! Please let us know if we can help with the renewal process or if we can assist in any way to make your experience even better! Thanks so much for your review, Bryce! We're happy that you're really enjoying your time with us! Let our team know if we can do anything to make your experience at 111 South even better! Living here is great ! I have a poolside view. Great customer service ! Friendly people environment ! The rooms are pretty spacious ! I would recommend moving here ! Hey, Tomisha - thank you so much for your recommendation! It's awesome to know that you're enjoying your experience with us and we appreciate your feedback! I love staying in 111 south. It is so clean there and it just looks so nice. I previously stayed at kennedy hall and it was a mess, with all of the mold and bad neighbors. But with certain rules and standards set with 111 it makes my living experience so much better. Thanks so much for your review, Justin! 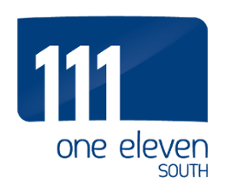 We're thrilled to know that 111 South is exceeding your expectations for your first off-campus living experience! Please don't hesitate to reach out to our team if we can do anything to make your time here even better! Maurice, thank you for your review and feedback! We're glad that you're enjoying your experience at 111 South! Our gates are on a schedule to be open for certain hours of the day to allow day time traffic, but we will certainly look into the performance of the gates to ensure they are working properly at all times. Thank you for addressing this issue with us! The staff is always where they need to be and always willing to help. I love The location because I could just walk to campus if I want to. The rooms are very spacious and all the amenities are very luxurious such as the pool, hammocks, tanning beds, Starbucks, game tables, etc. Hi, Rachel - thanks for your great feedback! Our team is happy to know you're enjoying the connivence of living close to campus and that you are taking advantage of the many awesome amenities 111 South offers! Let us know if there is ever anything additional we can do for you! Thank you for taking the time to share your review, Andrew! We're glad that you're enjoying the awesome amenities we have to offer and that you're pleased with the level of great customer service we strive to provide. Please don't hesitate to let us know if we can assist with anything to make your time here even better! The apartment itself is very spacious and open. I love the size of my bathroom/closet. I have tons of room for all of my belongings! The community overall is wonderful!! The staff works with you and are very helpful! Sydney, we're so happy to know that you're enjoying living with us and appreciate you taking the time to share your review! Please let our team know if we can do anything to make your experience even better! The 111 South community is an eye appealing environment. However, one thing I would like to see a change is, the fact that there are only two garbage stops and they are located in corners instead of being closer to the center of the complex. Hi, Shayna - thank you for your review! We will certainly look into additional options to make the trash stops more convenient for all locations throughout the community. Please let us know if there is anything additional we can do to assist in making 111 South the best place to call home! Has wonderful room and I love everything that 111 offers. only thing I would say is add another dumpster. My roommates were very cool and easy to live with. Thanks so much for taking the time to share your feedback! Our residents' opinions are important to us as it helps our team identify areas we can work to improve, as well as ensures us of the areas we are exceeding expectations. Let us know if we can do anything to make your experience at 111 South even better! 111 South is amazing! The people here are very friendly and I really love that it’s right across the street from campus. I would recommend 111 South to anyone looking for a place to live! Emma, thank you for your review and recommendation! We're so pleased that you are enjoying our community's convenient location and that our staff has impressed you with great customer service! Please don't hesitate to let us know if we can do anything additional for you! So far my expierence has been great. The staff is very helpful. Whenever we have a promblem they never hesitate to help. I like the updates we get on things going on and when we recieve packages. Hey, Carolyn - thank you for taking time to review 111 South! We're so happy you are enjoying your experience with us and that our staff has been able to assist in making your time here wonderful. Please let us know if there's anything additional we can do for you! The staff at 111 South is super helpful and nice, maintenance is handled in decent time frame, and the amenities provided such as the pool and gym are kept clean and I working order. Thank you for your feedback, Sofia! Our team is proud to know that we've been able to impress you with great customer service and quick attention to any issues or concerns that might occur. Please let us know if there is ever anything additional we can do to make your living experience excellent! Great staff, nice apartment, work orders take a while though but its ok! I’ve already renewed my lease for the next year so I’m excited!!!!! We're thrilled to have you as a resident again for next year, Jasmine! Thank you very much for your feedback and for being a wonderful loyal resident to 111 South! Everyone is so nice here and there isn’t much of a noise issue I also love the neighborhood and how well kept this area is. The property manager is really nice and was extremely helpful when I had to move here once Kennedy shut down. Jada - we're so happy to have you as a resident and are glad to know that 111 South has been a great first off-campus living experience for you. Let us know if there's ever anything additional we can do to continue to impress you! I have really enjoyed living here for the past 6 months! The office staff is always extremely helpful and friendly. I also really enjoy having a nice gym and pool to relax in during the summer months! Thank you for your review, Lauren! Our team is happy to know that you're enjoying your living experience at our community. We hope to see you by the pool this summer! Stay tuned into our social media for outdoor events like pool parties and Grill 'N Chill!